In 6-quart container or stockpot, mix water, salt and sugar; stir until sugar and salt are dissolved. Add turkey. Cover; refrigerate at least 12 hours but no longer than 24 hours. Heat oven to 325°F. 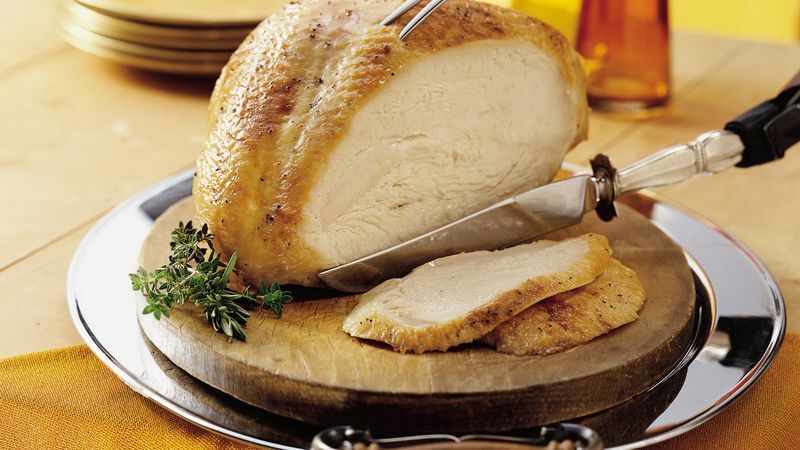 Remove turkey from brine, rinse thoroughly under cool running water and pat dry. Place onion on center of rack in large shallow roasting pan; top with rosemary, thyme and bay leaves. Place turkey, skin side up, over onion and herbs. In small bowl, mix butter and wine. Soak 16-inch square of cheesecloth in butter mixture until completely saturated; cover turkey completely with cheesecloth. Roast 1 hour 30 minutes. Remove cheesecloth. Place onion and herbs in pan with drippings if using drippings to make gravy (or discard). Insert ovenproof meat thermometer so tip is in thickest part of turkey and does not touch bone. Turn turkey skin side down. Roast 30 to 60 minutes longer or until thermometer reads 165°F. If you don’t have cheesecloth, you can baste the turkey with the butter and wine mixture after about an hour of baking and every 30 minutes after that until the turkey is done.